move out just because they have accessed the home equity that has been built up in their houses. The interest which builds up is added to the loan balance at the end of each month since there are no mortgage payments needed on such types of loans. The loan balance rises gradually and can even grow to exceed the value of the home mainly at the time when the value of the house is declining or if the person involved keeps on living in the home for more than the expected time period. However, the borrower is generally not required to repay any additional loan balance in excess of the value of the home. The reverse mortgage is also known as a Home Equity Conversion Mortgage (HECM). A homeowner who is above 60 years of age is eligible for the reverse mortgage loan. It allows him to turn the equity in his home into one lump sum or into payments which will be done periodically as agreed upon by the borrower and the banker. No repayment is needed as long as the borrower lives and he or she should take responsibility to settle payments of all taxes relating to the house and maintain the property as his primary residence. Maximum loan amount would be up to 60% of the value of the residential property. Maximum tenure of the mortgage is 15 years and the minimum is 10 years. Property revaluation to be undertaken by the lender once every 5 years. If at such time, the valuation has increased, borrowers have the option of increasing the quantum of the loan. In such a case, they are given the incremental amount in lump-sum. 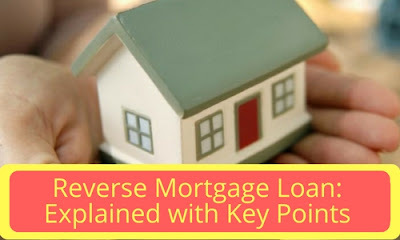 Amount received through reverse mortgage is a loan and not income. Hence it will not attract any tax. Reverse mortgage interest rates could be either fixed or floating. The rate would be determined by the prevailing market interest rates. House owners above the age of 60 years. If spouse is a co-applicant, then she should be above 58 years. Owners of a self-acquired, self-occupied residential house or flat, located in India. The titles should be clear, indicating the prospective borrower's ownership of the property. Property should be free from any encumbrances. The life of the property should be of minimum 20 years. Property should be the permanent primary residence of the individuals. Borrowers could prepay the loan at any time during loan tenor at no penalty or charges. The borrower can live in the house even if he outlives the tenure, but the lender may cease the monthly payment. Settlement of the loan is done only after the borrower's death. If one of the spouses dies, the other can still continue living in the house. After the death of both, the settlement of the loan takes place. mortgaged property is donated or abandoned by the borrower. If the borrower makes changes in the residential property, that could affect the security of the loan for the lender. This could be renting out part or entire house, addition of a new owner to the house's title or creating further encumbrance on the property. If the government under statutory provisions, seeks to acquire or condemn the residential property for health or safety reasons. According to the scheme formulated by National Housing Bank (NHB), 15 years is the maximum period of the loan wherein the property’s residual life should be 20 years or more. In case the borrower lives for a period longer than 15 years, no periodic payments will be made by lender. However the one who has opted for the loan can continue to occupy the house as long as he or she wants.